When I sat down to write today’s post—something profound and moving about folk and fairy lore, it was going to be—I was promptly handed a crying baby. If your home is anything like mine, this probably happens pretty regularly to you, too. Motion and profundity seem vaguely unattainable when one’s arms are constrained with a bundle of restless, dribbly discontent. Lately, my thoughts on folktale have been turning primarily around questions of space and landscape—the ways in which the places we live and how we treat those spaces shape the stories we tell. We draw our stories from the natural world, just as we perhaps draw our desire to create and imitate nature in our creations from a rarified instinct towards making things. Yet, inevitably—or perhaps, as in our more frustrated moments we feel, inelegantly—procreation is integral to nature. And with it comes the impulse to instruct, to preserve the knowledge we and our ancestors have gathered about how to survive in the spaces we inhabit. Wittingly or not, when we take it upon ourselves to speak with a child—or, better still, to tell stories to a child—we are cast in the role of the elder. Of course, this isn’t wholly flattering. 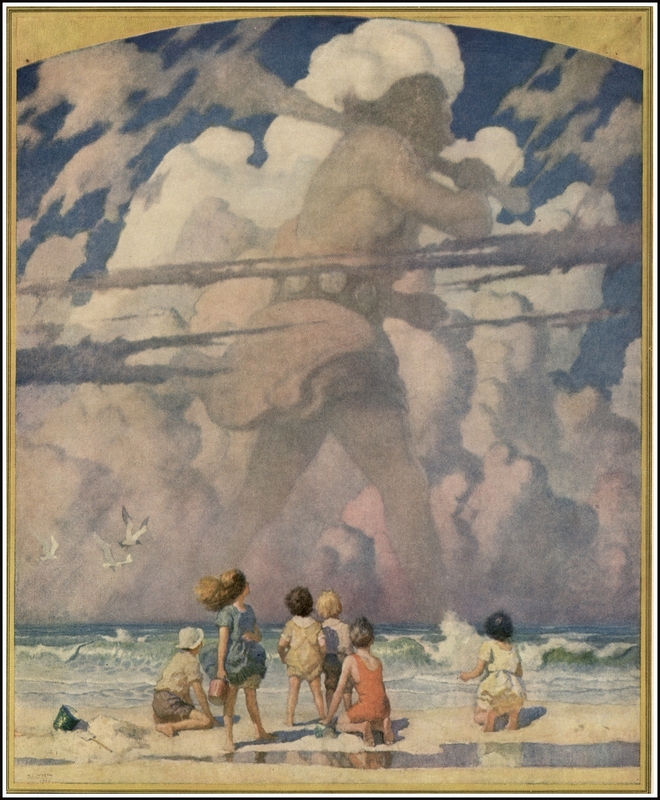 Giants in Western folktales, any rate, tend to be blundering and stupid—hiding their hearts where no one can find them, putting up NO TRESPASSING signs round nice gardens, guarding their castles with trees full of cats, and wanting the bones of Englishmen to grind. Children must learn to find their way in this land of giants, with its danger and its silliness and its befuddling outsize everything. How they grow to fit it, or outgrow it and overturn it—that is not, I think, ours to give. Nor is the role of elder ours to choose. But when we accept it, this strange new calling—elder, storyteller, long-remembering one—then the tales we choose to tell and the ways in which we choose to tell them are endued with an urgency not of our making. The elder, after all, holds the stories both of the people and of the land—both their own memories, and the myths that have received and refashioned. It may well be this conflation of myth and memory that makes a storyteller—that gives us stories worth telling. Laying personal remembrance onto old tales transforms and—I won’t say revitalizes—but re-estranges them. It has the potential to recreate the wonder a child has at hearing these stories for the first time. The stories which deserve to be called mythic are those which give form where none is visible. These stories suggest that there is some pattern of understanding the vivid, nameless, wordless chaos children are born into. Historically, the tendency has often been toward sharply delineated, didactic patterns. But there has always been a pull towards the untidy, the inconclusive—patterns that recall the child’s own experience of the world. We could call this experience wonder—in several senses of the word. The land does speak with a profound and, yes, mythic voice: teaching us its patterns, if we are willing to watch and to listen. But the land can only be heard when we present as part of its growth and—we hope–renewal. The question once again is whether we are willing indeed to listen, and whether, having listened, we’ll offer to others our memoires of what we heard.